Your private woodlands retreat awaits. 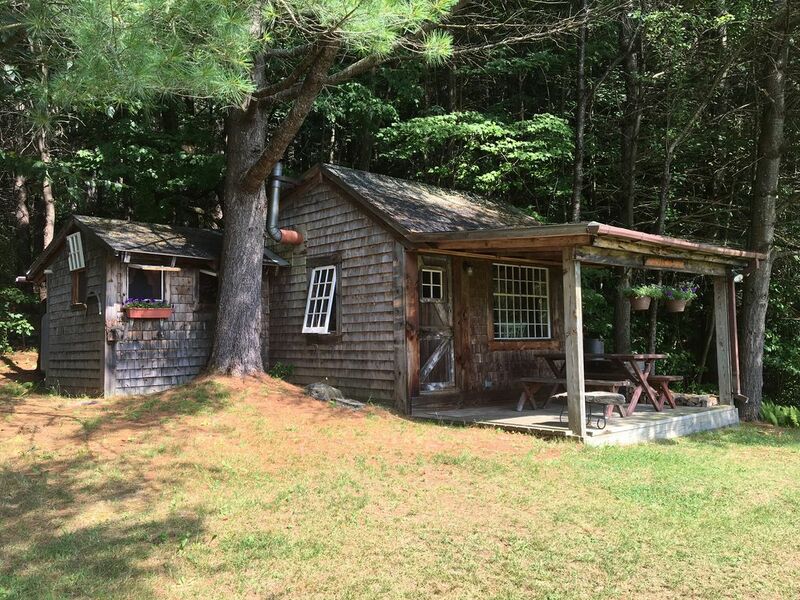 Nestled atop a beautiful 10 acre meadow with 25 acres of woods for you to enjoy; this rustic cabin is a perfect romantic hideaway. Two trout ponds are steps from your door for fishing and swimming. Just a few minutes from Mt. Ascutney's hiking and mountain-biking trails and in the middle of fantastic cycling country. Sunset Cabin is a marvelous spot for enjoying fall foliage and exploring Vermont's quaint towns and covered bridges. This is a magical place. The cabin is comfortable, rustic, and private, with brand new furniture, bedding, and linen. But what's special about it is it's extremely romantic setting overlooking meadows, ponds, gardens, mountains, and woods. A perfect getaway cabin in Vermont. Although our stay was (too) brief (2days) , we were cozy & comfortable. We met Daniel who was friendly& accommodating. He made sure we had plenty of wood for fires in the evening . One starry night was beautiful. We hiked at nearby Ascutney State Park & enjoyed visiting the recommended places to eat. The cabin was rustic as described so this was not a surprise. We love places off the beaten path and enjoy disconnecting from devices and spending time in the great outdoors. This is a wonderful property however; our first night was extremely cold and we were not able to sleep due to the cold damp environment. We notified owners soon after our arrival - around dinner time. There was indeed a small electric heater that we turned on however; it was so damp inside that the temperature felt much cooler inside than outside and that little electric heater didn't budge the temperature inside. Upon arrival there was much condensation on the windows and a damp musty smell. We understand this is rustic however it was fall during our stay and the propane heat should have been turned on to dry out the dampness inside the cabin prior to our arrival. The owners did send a friendly maintenance person at 9 am the following morning and he managed to get the propane heater up and running. It took two days for the cabin to become comfortable. Disappointing for sure. I'm sure this place is wonderful in the summer however; come fall - I recommend the heater be turned on and the owners should check out the place for moisture and dampness prior to any future fall guest arrivals. Other than the temperature and dampness we absolutely adored this place and so did our pup. The property is beautiful! We had a great time staying at Sunset Cabin. The cabin had everything we needed, along with some extra amenities like snacks and toiletries. It was a very special stay and it’s obvious that the owners care about the comfort of their occupants. We had a nice morning strolling through the trails on the property and birdwatching. It’s a beautiful area, quiet and remote. We would love to come back! Perfect little hide a way. Very peaceful. Intimate yet very functional cabin, with many thoughtful extras provided. Might be a challenge for overweight people. The bed is very comfortable. Table large enough for games. Feels like luxury camping surrounded by nature but oh so comfortable and dry. Nice hot shower. Great place to relax, rest and enjoy nature. Close to many natural wonders. Brought a box fan which was perfect for moving air around. Trout pond was not as impressive as on pics. But overall cabin was awesome! We loved this cabin!!! If you would like to enjoy a quiet, relaxing and refreshing/rejuvenating place, chose the sunset cabin. You will be alone with nature in a huge property with beautiful ponds, hiking trails and lawns with neatly trimmed grass for yoga practice or morning run. The cabin has everything you might need (clean towels, fresh linens, convenient reading lamp, kitchen appliances, bug spray, plastic bags, aluminum foil, flashlight, umbrella ;) and so on). The cabin doesn't have an internet connection and our cell phones didn't work there, but it was an additional benefit for us - we wanted to forget about a city and enjoy beautiful nature. While staying in there, we visited the Ascutney state park for hiking, explored Quechee gorge and Woodstock. We highly recommend this cabin!